In December of 1984, it will be forty years since one of America’s greatest heroes, General George S. Patton, was executed by his Communist foes. General Patton was struck down the day before he was scheduled to make a triumphant return to the United States. He had just been removed from his command of the Third Army, which was in charge of governing the American sector of Germany. Because he not only opposed the dismemberment of Germany, but also because he favored military action against the Communists. As the most popular hero of the Second World War, Patton would have been unbeatable in a Presidential race. This was the reason his skulking enemies ordered his execution before he could leave Germany. The Patton Papers, 1940-45 recently published by Houghton Mifflin Company in Boston, gives ample reasons for the murder of General Patton. A few months before he was killed, his driver for five years, Master Sergeant John L. Mims, was replaced. Patton was asked by Major General Gay to accompany him on an excursion for a few hours the day before he was to return to America. 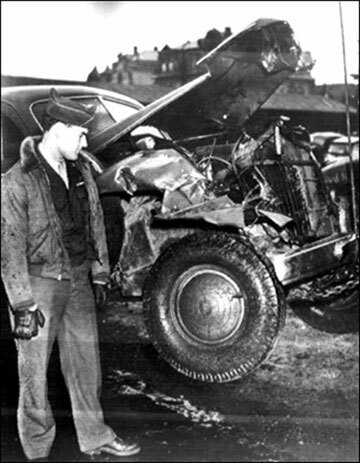 At 11:45 A.M. in clear weather and on a straight stretch of road, the driver of a GMC military truck turned his vehicle directly into the side of the 1938 Cadillac 75 Special limousine in which Patton was the only person injured. He suffered some internal injuries but did not seem to be seriously hurt. On Dec. 21, 1945, it was announced that he had died of an “embolism”, that is a bubble of the blood which is fatal when it reaches a vital organ. It can be introduced into the bloodstream with a syringe by anyone with brief medical training. Patton was a vigorous sixty years old with enormous reserves of energy, who seldom needed more than a couple of hours sleep a night. Not only did the U.S. Army make no investigation into the “accident” which had put him into the hospital, but no questions were raised about his “embolism”. On previous occasions when attempts were made to kill him investigations were made, despite the fact that he was one of the most popular and most powerful figures in America’s history. He recorded in his diary that on April 20, 1945, while observing the front in his personal plane, which was clearly marked, an RAF Spitfire made three passes at his plane, which attempting to shoot it down, then went out of control and crashed. The story was later put out that a Polish flyer had been piloting the Spitfire. Patton was not injured. Patton’s military exploits were such that he was the only American general whom the Germans feared. They transferred entire divisions as soon as rumors were spread that he was on a given front. The Germans’ contempt for Patton’s fellow generals was shared by himself, as he proves on many pages of his diary. During much of World War II, Patton survived repeated efforts of his fellow generals, as well as the British leaders, to get rid of him. 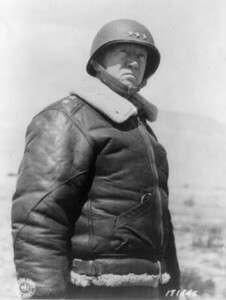 In 1943, when he had turned the tide in Africa with his brilliant victories at Gafsa and Gela, Patton was removed from command after Drew Pearson printed a story that Patton had slapped a malingerer at a field hospital and called him a “yellow-bellied Jew.” Eisenhower used this incident as an excuse to refuse Patton command of American ground troops in England, giving the command instead to Omar Bradley, whom Patton exposed as a cowardly dullard. We will never know how many casualties Bradleys’ cowardice and incompetence cost us, but it must have been many thousands. Patton was extremely disgusted with Eisenhower’s infatuation with his “chauffeur”, Kay Summersby, and he persuaded Ike not to divorce Mamie in order to marry her. Kay Summersby was a British Intelligence Officer who had been ordered to prostitute herself to Ike so that he would send American troops into the line instead of the British. England had experienced such a terrible bloodletting at the hands of the German armies in World War I that Churchill and the other British leaders determined to sacrifice Americans wherever possible on the Western front. Although Kay Summersby secretly despised Eisenhower, she was a loyal British subject, and she successfully carried off the affair. It is estimated that she cost the United States 100,000 casualties which otherwise would have been borne by the British. As a result of Patton’s bold advances in France, Field Marshall Montgomery persuaded Eisenhower to issue one of the most amazing military orders in history. All of the Allied Armies must advance exactly abreast, so that no one (meaning Patton) would receive “undue credit.” Throughout the war, Patton achieved his amazing victories by being in the field, whereas the other generals remained far behind the front in their dugout “headquarters” or in luxurious villas far from the sound of gunfire. Eisenhower’s refusal to allow Patton to take Prague and Berlin, holding him back while the Russians occupied these critical capitals, remains one of the greatest performances of treason since Benedict Arnold, like Eisenhower, sold out to the British. Patton was removed from command in Germany because he actively opposed the swarm of locusts, such as the recently recruited Soviet agent Henry Kissinger, who fought Patton to win control of the Military Government in Germany. On August 31, 1945, Patton wrote to his wife. “THE STUFF IN THE PAPERS ABOUT FRATERNIZATION IS ALL WET. ALL THAT SORT OF WRITING IS DONE BY JEWS TO GET REVENGE. ACTUALLY, THE GERMANS ARE THE ONLY DECENT PEOPLE LEFT IN EUROPE. Removed from command by the Jewish plot against him, General George S. Patton would have to return to the United States to work for the good of his country. It was to prevent this that a truck smashed in the side of his car in one of the strangest and most-ignored event in America’s military history. Those who fight for America are always in danger, always thwarted by the plotting and the treachery of the subhumans whom Patton recognized and battled to the end of his life. His story is one which enlightens and inspires us all, and this is why we must, after forty years, remind the American people of the cowards who murdered him.